Find My Workspace lists over 95% of the executive office suites market in Overland Park. Simply click Request Quote to check pricing for one office, or Add to Basket for multiple offices. At this center you’ll find the flexibility and functionality you’ve been craving – everything you need to unleash your potential. 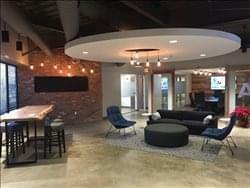 This center offers Private Offices – Dedicated Desk – Coworking Memberships. Launching a business as a solo entrepreneur, or working virtually as a part of a small team can sometimes feel isolating, so this space was created to help facilitate collaborative learning in a stunning environment. Networking comes naturally when you’re surrounded by visionaries, trend-setters, and entrepreneurs. With floor-to-ceiling glass windows the office space and executive suites are full of natural light providing a bright and airy working environment Plenty of natural light, exposed ceilings and industrial fixtures. There is an on-site café and coffee shop, great for grabbing a quick bite of lunch or coffee on your break. Furthermore there are sleek, modern conference rooms available which can accommodate up to 12 people. Larger event & meeting space that can accommodate up to 200, Coworking space and private offices are available now! Great for individuals and small teams who are looking to be in a collaborative and energetic environment. Offices start at $800/month. 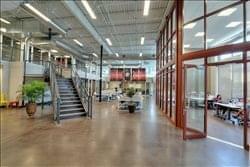 This center offers private office spaces primarily set up for teams of three – eight people. The offices are differentiated from other flexible workspaces by the size and spaciousness of the space. Each office is fully furnished and the monthly rental price includes an in-office lounge area with White-boards where you can conduct informal meetings brainstorming sessions. Each office has a personal coffee station and a private WiFi network and tenants have access to a conference room and printer usage. The centre is all about efficiency, with a minimum contract term of three months and complete flexibility after that, you can be set up on your private network and ready to work almost as soon as you walk through the door.